Alcohol does not make you big! 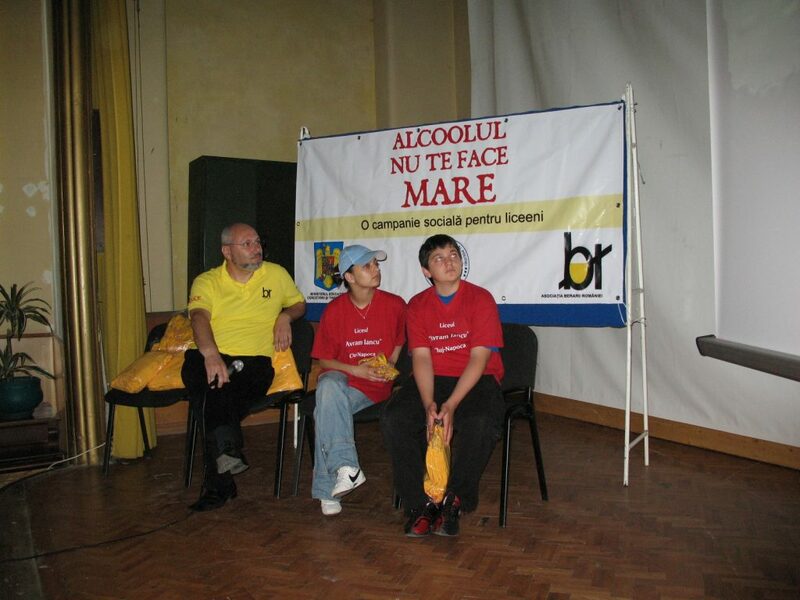 Aiming at promoting an effective change in the behavior of Romanian teenagers, the national campaign „Alcohol does not make you big” was launched as a pilot project in Bucharest, 2006. 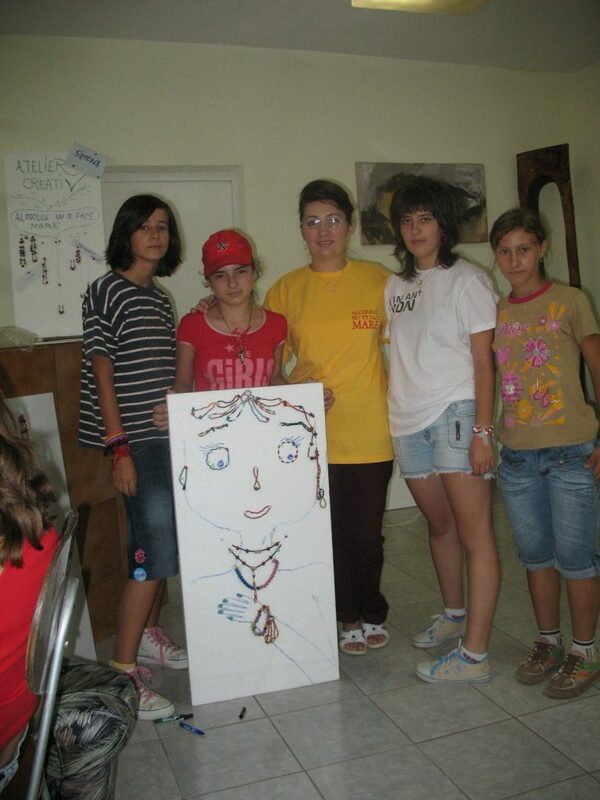 The audience targeted by the campaign comprises in adolescents, teachers – through lesson plans specially drafted on this topic, as well as parents – through a Guideline for parents focused on the issue of alcohol consumption among teenagers. 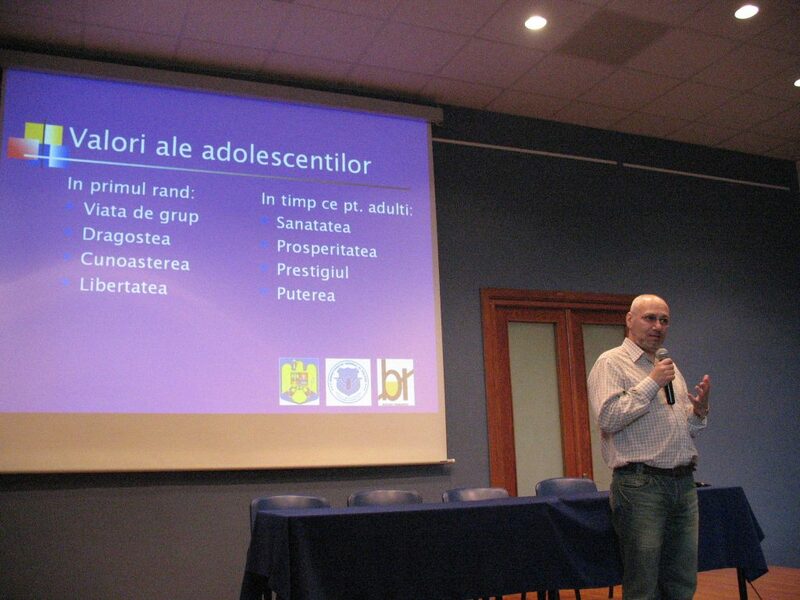 Direct dialogue with adolescents was set out with the help of two image vectors of the campaign: dr. Cristian Andrei and Leonard Doroftei. The program included group counseling sessions with psychologist Cristian Andrei, educational videos, a guideline dedicated to parents and training sessions for teachers aiming at drafting dedicated lesson plans. Inscribed under the auspices of the organization Brewers of Europe, the program received positive feedback from the European Commission in Brussels. 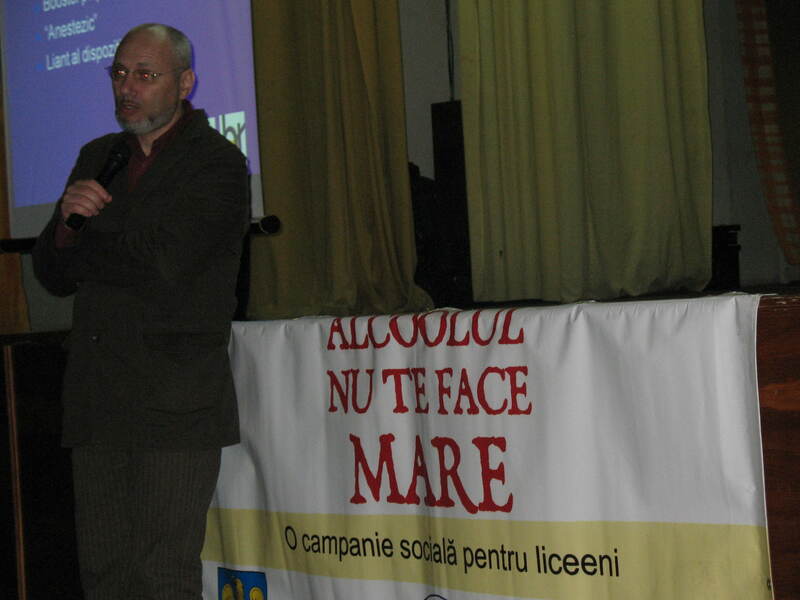 As part of the Forum on Alcohol and Health, Dr. Cristian Andrei, promoter of the campaign, described it as an illustration for good practice, revalidating the commitment undertaken by the Romanian brewers to promote the responsible consumption of beer. 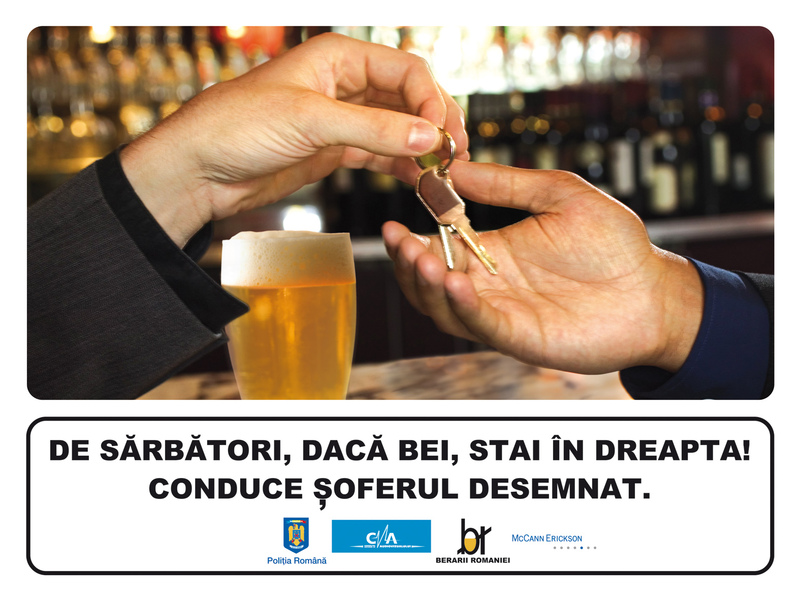 The campaign was supported by the joint efforts of the Ministry of Education, Research, Youth and Sports, General Inspectorate of the Romanian Police and of the „Brewers of Romania” Association. 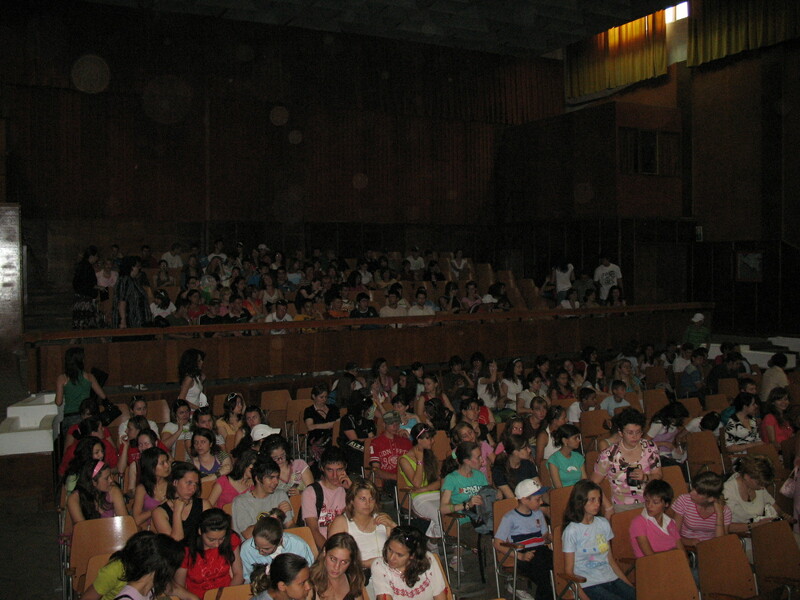 Thus, over 2000 high-school pupils in seven cities participated in group counseling sessions coordinated by Dr. Cristian Andrei. Educational materials and videos focused on „What means to be cool” and „The price of an athletic life” were distributed throughout the period of implementation of the program with the help of „ambassadors”, namely over 1.200 teachers in the pre-university educational system. 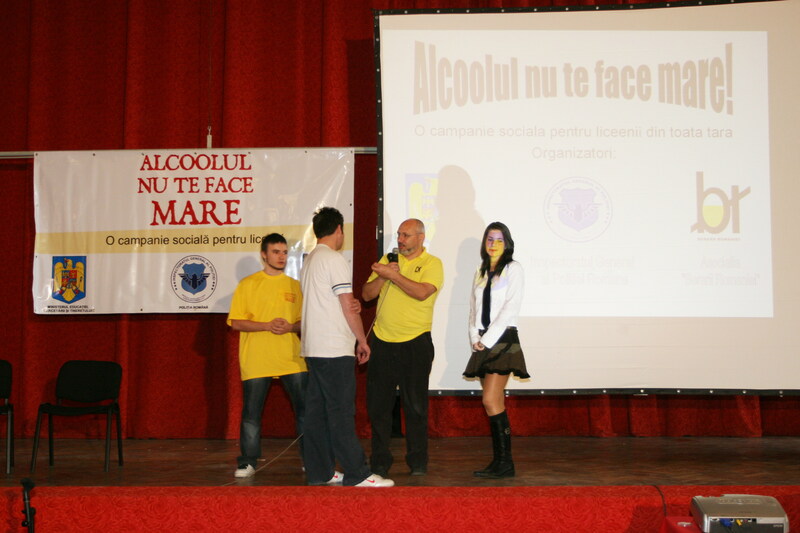 As part of this campaign, the Association also launched a guideline dedicated to parents, distributed in 7.000 copies and downloaded for over 4.000 times from the campaign website www.alcoolulnutefacemare.ro. Pass the wheel when you drink! 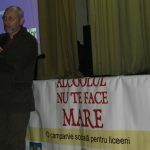 From its initiation, the Association Brewers of Romania had as main purpose taking responsible actions for the beer consumers in Romania, by promoting moderate and responsible consumption. Thus, the launch of a campaign aiming at informing drivers of the dangers they expose to when driving under the influence of alcohol, underlines again the social commitment of the Association. The project is a long-term initiative focusing on educating drivers, launched and rolled out with the support of Road Police Directorate within the General Inspectorate of the Romanian Police Office and of the National Audiovisual Council. The campaign is addressed mainly to drivers of 18 – 35 year old living in urban areas, independent, sociable persons with an alert rhythm of life. Launched in 2008, the campaign alternated in time two strategic stages: draw attention and call-to-action. Throughout time, considering the wish to be aligned to European policies, the campaign was also based on two concepts: Don’t Drink and Drive (2008 – 2009) and Designated Driver (2009 – 2011). 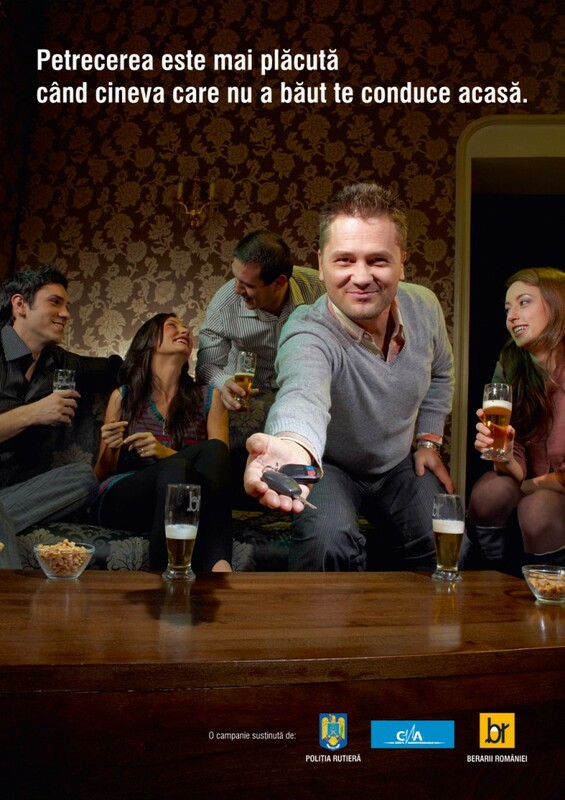 Scheduled to take place during the winter holidays, when the prevalence of excessive alcohol consumption is higher, the campaign debuted with a TV ad broadcasted between December 2008 and January 2009. The slogan used was the following: Reality changes when you drive drunk. The broadcasting of the ad accounted for the strategic stage to draw attention. In the spring of 2009, a campaign re-call was developed with the installation within the central area of many cities in the country of Christmas lights so as to reinforce the well-known slogan: Reality changes when you drive drunk. In 2009, the campaign initiated the second strategic stage: call-to-action. Thus, selecting a visible media channel for drivers – an outdoor network present in over 10 cities in the country, the campaign benefited from a relatively suggestive visual aid mainly illustrating the slogan: If you drink on Holidays, sit on the right! The designated driver drives. Year 2010 returned the campaign into the raise-awareness stage, as the slogan selected to accompany the visual aid posted in the outdoor network referred to: Party is greater when someone who did not drink drives you home. The presence in the 10 cities of the country was maintained. 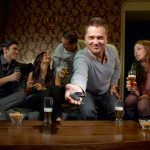 In 2011, the campaign re-entered into the call-to-action phase, aiming at achieving a better assimilation of the message, it became: Pass the wheel when you drink! The rally pilot Titi Aur accepted the invitation to be part of the campaign, both within the visual aid as well as within the video arrangement broadcasted on the TV channels. Thus, through the campaign, Titi Aur recommended the auto drivers to select a different means of transportation in order to arrive home: public transportation, taxi etc., in case they consume alcoholic beverages.